Read our full review of Nokia 95. This Symbian smart phone is a doozy. Sporting an innovative two-way slider design, the N95 features a 2.6-inch 24-bit color QVGA TFT display (240 x 320 pixels), a 5.0-megapixel digital camera!, 150MB of internal memory, microSD card slot, two 3D stereo speakers, integrated GPS, Wi-Fi (802.11b/g), 3g HSDPA, S60 browser, ATI 3D graphics chip for gaming, video calling, mini USB, and dedicated music keys. The design allows you to switch between different modes; you can slide the dial pad down to make calls or slide the dedicated media keys out in the opposite directions, automatically converting the 2.6-inch QVGA screen to landscape mode. The mobile also comes with a Maps app that contains maps for more than 100 countries. 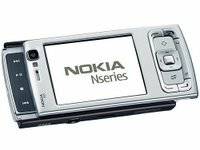 The impressive two-way Nokia N 95 slider phone will be available in the first quarter of 2007 at an estimated retail price of 550 euros, or around $700USD.